President Bush on Thursday said Syria is "out of step" with other nations in the Middle East and said the United States will work with other countries to pressure Damascus to remove its troops from Lebanon. 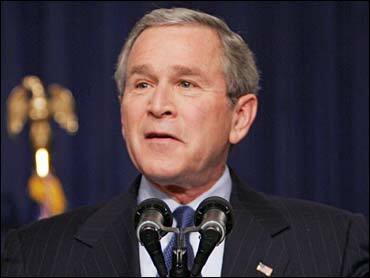 Bush said he did not know if Syria was involved in the assassination of former Lebanese prime minister Rafik Hariri. "I can't tell you yet," Bush said. "I don't know that. I'm going to withhold judgment until we know what the facts are." Bush said he would consult with allies about Syria when he visits Europe next week, and said the United States supports an international investigation of Hariri's assassination. Despite a claim of responsibility by an unknown Islamic radical group, many people inside and outside Lebanon still suspect that Syria was behind Monday's blast that killed Hariri and 16 others, reports CBS News Correspondent David Hawkins. "It fits totally with the pattern of Syrian behavior in Lebanon," Samir Kassir, a columnist with the newspaper An-Nahar, told Hawkins. "They control everything in the country, everything. I cannot imagine that it's possible to assassinate a former prime minister without the secret service having any clue about that." The United States has withdrawn its ambassador to Syria, Margaret Scobey, and that "indicates that the relationship is not moving forward," the president said. He said Syria was "out of step with the progress being made in the greater Middle East." The United States expects Syria to find and turn over former supporters of Saddam Hussein's regime and send them back to Iraq and stop supporting terrorism, Bush said. He said Syria also must comply with U.N. resolutions calling for it to withdraw from Lebanon. Syria has 15,000 troops in Lebanon. Bush spoke at a news conference where he announced that John Negroponte, the U.S. ambassador to Iraq, will be the nation's first director of national intelligence. In Beirut on Thursday, Hariri's family said they also supported an internationally led investigation, setting the scene for a standoff with the Syrian-backed Lebanese government. "We call upon the international community to promptly take control of this issue and form an international investigation commission, since the assassination of Rafik Hariri is a terrorist act targeting Lebanon's stability and national unity," said a statement released by Hariri's family. "We will not spare any effort or means to find the perpetrators of this crime no matter what their affiliation is," the statement added. Lebanon's government opposes a foreign-led investigation. It has, however, verbally requested foreign investigators, including Swiss forensic and explosives experts, assist the inquiry. Many Lebanese are seething over the death of Hariri, whom they credit with rebuilding their country following the devastating 1975-90 civil war, and more than 200,000 mourners attended his funeral Wednesday. Government officials did not attend, at the insistence of Hariri's family. Hariri resigned as prime minister last year amid opposition to a Syrian-backed constitutional amendment that extended the presidency of his rival, Damascus ally Emile Lahoud. Lebanese Interior Minister Suleiman Franjieh, who paid a condolence call to Hariri's home Thursday, afterward renewed his government's opposition to calls for an international investigation. "We have said that we can seek help from international experts. But we cannot abandon our role and bring in (foreign) states to investigate," he said. Swiss ambassador Thomas Litscher met both Lebanese President Emile Lahoud and acting prosecutor-general Rabia Kaddoura on Thursday, who both sounded him out about Swiss assistance in the murder inquiry. A formal written request is expected to be made Friday. "Both of them have in fact informed me about a request (for) Swiss experts in ... explosives and DNA analysis (to) assist the investigation of the bomb attack on Mr. Hariri," Litscher said. Lahoud released a statement saying the investigation will continue until the "ugly crime" has been solved, adding "the decision to seek help from Swiss experts in the fields of explosive and DNA aims to help Lebanese experts." It was unclear if or when any Swiss experts would arrive. Hariri, a charismatic man whose wealth and prominence gave him some degree of independence from Syria's political influence in Lebanon, led his country for 10 of 14 years following the war and was expected to stand in parliamentary elections scheduled for April and May. He had not ruled out another run for the prime ministership. The intense international pressure to find his killers has increased anxieties in Lebanon and its neighboring powerbroker, Syria, which has announced it is seeking stronger cooperation with Iran.